I love that shade of blue and the woodgrain background - perfect! You had the perfect die for this challenge. I do love the woodgrain! Perfect take on the challenge, Cat--beautiful card! I love your routine today... LOve your fabulous figure skates die! A gorgeous card, Cat! 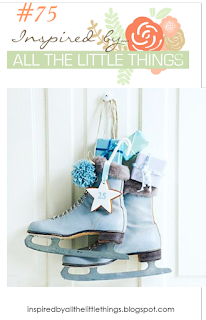 Those are a darling pair of skates on a wonderful wood background, Cat. Thanks for sharing your card at Inspired By All the Little Things. Very pretty take on the inspiration! Love the wood grain background! Thanks so much for playing along with us at Inspired By All The Little Things this week! Congratulations on your shoutout! Your card is so pretty! Love that wood-grain embossed background!